Violinist Katie Wolfe leads an intriguing career mix as a soloist, recording artist, chamber musician, orchestral leader and adjudicator. She has performed in the United States, Canada, Costa Rica, Bolivia, Malaysia, Korea, Japan, the Soviet Union, Italy, Spain and the Netherlands. She also shares her passion for music as a teacher. Originally from Minnesota, she joined the string faculty of The University of Iowa in 2004 as Associate Professor of Violin. 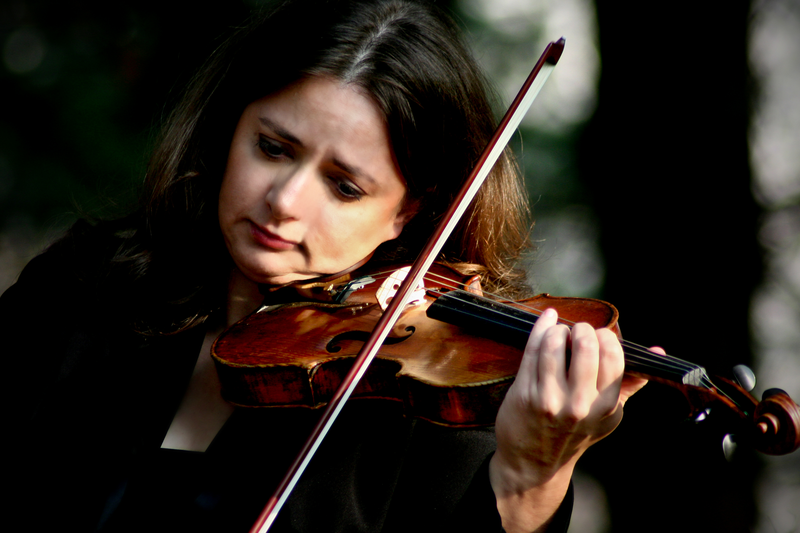 Prior to teaching in Iowa, Ms. Wolfe taught violin, viola, and chamber music at Oklahoma State University. She also served as Associate Concertmaster of the Oklahoma City Philharmonic. Ms. Wolfe has recorded for Centaur Records, Albany Records, Newport Classics, and Kleos Classics. During the 2006-2007 season, she recorded the Sonatas for Violin and Piano of Danish composer Niels Gade, the music of Madison composer Laura Schwendinger, and a piano quartet by David Gompper. In 2006, she made the first recording of a “rediscovered” Sonata for Piano and Violin by Joseph Haydn with Byron Schenkman, released by Centaur Records in 2006. and a piano quartet by In 2006, she made the first recording of a “rediscovered” Sonata for Piano and Violin by Joseph Haydn with Byron Schenkman, released by Centaur Records in 2006. Ms. Wolfe is a founding member of the Matisse Piano Trio, formed in 2004 with fellow University of Iowa faculty pianist Ksenia Nosikova and cellist Anthony Arnone. The trio is as committed to teaching as well as performing, and they have given masterclasses and performances at universities and other concert venues in Iowa, Minnesota, Missouri, Oklahoma, Texas, New Mexico, and Hawaii. Along with pianist and composer Ketty Nez from Boston University, Ms. Wolfe has been involved in the creation and performance of many newer works for violin and piano. The Wolfe/Nez Duo performs works written especially for them, in addition to other works written in the past 20 years and other masterpieces of the 20th Century literature. Their adventuresome programs have been presented at the University of Iowa, Boston University, and the Eastman School of Music. Upcoming performances include appearances at the Oberlin Conservatory and the University of Rhode Island. In the 2006-2007 season, Katie and Iowa pianist Alan Huckleberry collaborated with the Iowa Composers’ Forum to present works by Iowa composers at universities throughout the state. They performed six recent works for violin and piano, including two world premieres. Ms. Wolfe received a B.M. in violin performance from Indiana University, where she was a student of Miriam Fried. She coached chamber music with Rostislav Dubinsky and Janos Starker, among others. She continued her studies, earning a M.M. in violin performance from the Manhattan School of Music (MSM), studying violin with Sylvia Rosenberg and chamber music with Ani Kavafian and Peter Winograd of the American String Quartet. She received further training from a wide variety of summer festivals and teachers, including the Tanglewood Music Center, Kneisel Hall, Musicorda, the Quartet Program, Solo Bach Seminar with Baroque violinist Stanley Ritchie, and many others. After graduating from MSM, Ms. Wolfe received the prestigious Fulbright Lecture Award to teach and perform in Bolivia. She formed a string quartet which performed educational and public concerts throughout the country, taught at the National Conservatory, and served as Associate Concertmaster of the National Symphony of Bolivia for one season. Through this experience, she discovered a deep affinity for teaching, transmitting the wealth of knowledge gained from her teachers and performances, and sharing her love of music with others. After returning from Bolivia, Ms. Wolfe broadened her musical career as a violinist and teacher in New York City. She performed and toured with groups such as Jupiter Symphony, Philharmonia Virtuosi, Manhattan Chamber Orchestra, the S.E.M. Ensemble, City Island Baroque Ensemble, in Broadway pit orchestras, and with many other ensembles. She taught at the Bloomingdale School of Music and as an adjunct faculty member at Hofstra University on Long Island as a member of the Hofstra String Quartet. Katie Wolfe is privileged to perform on a rare Italian violin made by Gaetano Chiocchi in 1860.